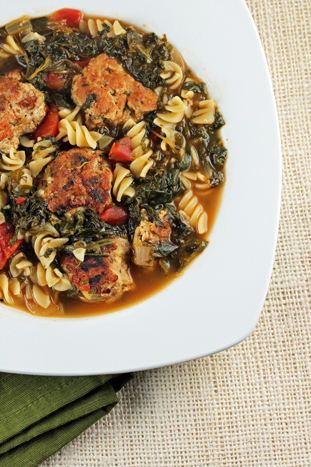 Here is my version of Italian Wedding Soup. So yeah. There’s going to be a wedding this year. My sister’s!!! I’m honored to stand beside her as the matron of honor, and I’m thrilled that Charlie gets to be a ring bearer! And while I’m not sure it’s going to be a full fledged Italian affair with breaking glass and la borsa, it is a wedding and there is an Italian! So I made this soup in honor of them…the happy couple! Go ahead. Grab a spoon. Reach on through the screen. Just a little taste! In a mixing bowl, combine the ground chicken, bread crumbs, eggs and Italian seasoning into 3/4 inch diameter meatballs. In a large saucepan or Dutch oven, add the olive oil and brown the meatballs on all sides. Add the 2 cups of homemade chicken stock and 3 cups of water. Feel free to add water as needed. Stir in the diced tomatoes, and frozen spinach. Bring to a rolling boil. If you plan to let it simmer, reduce heat to low. Add the pasta noodles about 12-14 minutes before you’d like to serve the soup. 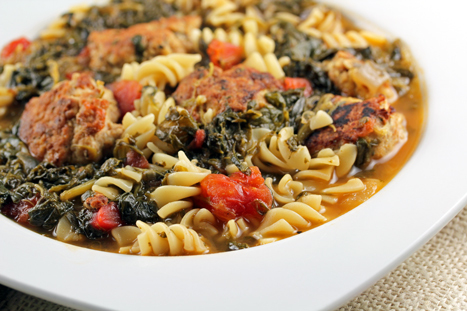 Do not let them overcook, or you’ll end up with Mushy Italian Wedding Soup! Serve as is, or with a slice of bread or side salad. Looks so yummy! Does that have onions in it too? I have always heard about this soup but never tried it. It looks so healthy and good…..I think for us this would be a great soup on a rainy, chilly spring day with a crusty loaf of bread or a grilled sandwich along side…yum! Congrats to your sis and her “Italian” hubs-to-be! journey as nicely as some fantastic books to go through. engine optimization, Search engine marketing New York, Website Optimization New York. You can certainly seee your skills within the work you write. All the time go aftsr your heart.